Assume a data file with 80+ million ones and zeros, randomly generated. From this file, we want to create a list of random decimal integers. This is the plan to do this conversion. Divide the 80 million digits into groupings of 4 binary digits. Convert each 4-digit binary to decimal. Discard all decimal values greater than 9. Here is the concern. The 24 binary digits that comprise the 6 groupings of 4 binary digits that correspond to the values 10 to 15 contain 17 ones and only 7 zeros. Will this imbalance affect the distribution of even vs. odd integers, or compromise randomness of the final string of decimal digits in any way? Update: From the answers posted, it seems the method enumerated above is sound. I agree with that conclusion. However, I still do not understand why removing more than twice as many ones as zeros from the binary string does not bias the outcome toward fewer odd numbers. I seek explanations. Your procedure throws out strings 10 through 15. So in the cases that you actually use, you'll be choosing 0 through 9, each of which is equally likely, as desired. And we know the generated decimal digits are independent of each other because each uses a separate string of 4 bits and all the bits are independent. Your procedure constitutes a simple kind of rejection sampling. Not the answer you're looking for? Browse other questions tagged monte-carlo random-generation randomness or ask your own question. 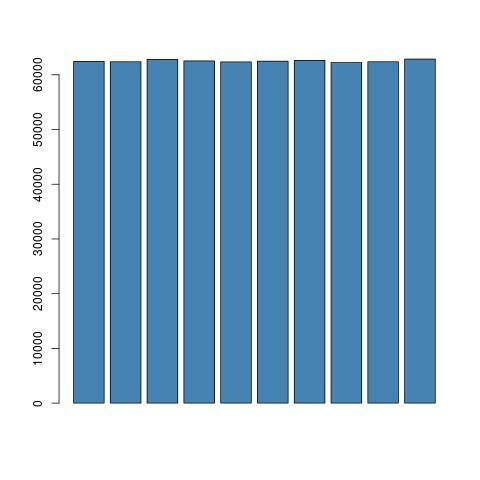 Why should random numbers be drawn from a distribution? How best to form many short, independent random numbers from one long random number? Random sequence and uniform distribution? Is this always the case?